More or less following the architectural structure of the novel, leaving out great chunks rather like a glacier dropping over and breaking up on reaching its last morrain, this film reflects the lives of ordinary people in ordinary Madrid in the post-civil war years, but from a rather biased angle. That is to say that in his novel Cela painted a few sketchy characterizations, strung them all together in no definite order, and hoped for the best. The film more or less did the same. Without any doubt, we can glean certain relevant points from either the novel, or the film, whichever you prefer, but at least the latter is shorter. From rather whimsical scenes in which the dialogues are of maximum importance but barely reach more than a level of superficialities (anything deeper would have worried the censors), Cela cooked up an aimless wander around his dozens of persons without reaching any depths, without broadening characteriological perceptions, such that you feel you have been reading about people who only existed (barely existed) in the author's own imagination. The film corrects this anathema a little, simply because the characters become visible and thus more real-like. Helped greatly by the sets used which give a really good impression of those years, especially in the `Café Delicia'. 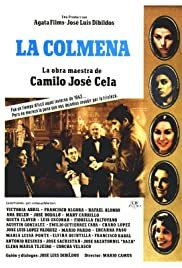 The film boasted the participation of just about everybody in Spain at the time who had any kind of name in cinema, theatre or television, and even the author himself had a small part. For anybody interested in Spanish life but more specifically the Spanish language, the film is worth its time. But it is not worth wasting any more time over. It's too banal, floating over too many participants without any specific purpose. It has its moments which might just drag out some wry grimace or sardonic chuckle.